Pray for Peggy Scudiere as she broke her ankle in Rwanda. She had surgery later in the day and will have to shorten her trip. We will post updates as we receive them. It was a great start today, Tuesday, February 16. On Monday John and Peggy and Christina and I traveled northwest to the little village of Cymagabuhe, where Christina and Peggy met with about 20 Pastor wives. Shane and Jeffry stayed in Kiglai to teach James to the Pastors. After we finished in Cymagabuhe, we traveled to Ginsenyi to spend the night at a Presbyterian Guest House. This city of 100,000 is located on the northern end of Lake Kivu and right on the border with the DRC. We started off the day visiting the local church in Ginsenyi, which is pastored by a good friend, Aaron. It was a delight to see the church facility, see the good work Compassion International is doing in their project through the church, and visit in the classrooms of the Nursery school. Peggy delighted with her conversation in Kinaye Rwandan and me not quite as much with my stories of frozen rivers in our winters. We then traveled to the DRC border crossing. A local agent gave us a birds eye view of the going on of the daily crossings that average 45,000/day on foot. Then we visited the shore of Lake Kivu where Christina and Peggy got their feet wet. After completing the 3.5 hour trip back to Kigali via the curvy, ridge top roads of Rwanda, we arrived at the teaching point. I was anxious to join Shane in his teaching and Peggy and Christina were eager to greet the Pastors for the first time this year. The entrance to the Kimirunko church is down a fairly slippery, clay slope that does not have steps and has a fair amount of loose grave. Just as I said to watch your step, Peggy slipped and fell despite John’s steadying hand. Then all heck broke loose as Peggy calmly announced that she had broken her ankle. X-rays later showed see had an “open fracture” of both bones in her leg. The Pastors carried her to the car which quickly transported her to the hospital. We are told it is the best hospital in Rwanda, the King Faisal Hospital. Interestingly, you pay for medical services in advance in Rwanda and the hospital only takes cash and Visa. A quick call to LCU raised my debit card purchased limit, and things were put in motion. We have also been in contact with the insurance company through whom we bought insurance for the trip. They will reimburse and we will also need them to change their travel arrangements heading home. As I write, we sit waiting to hear the results of her surgery. 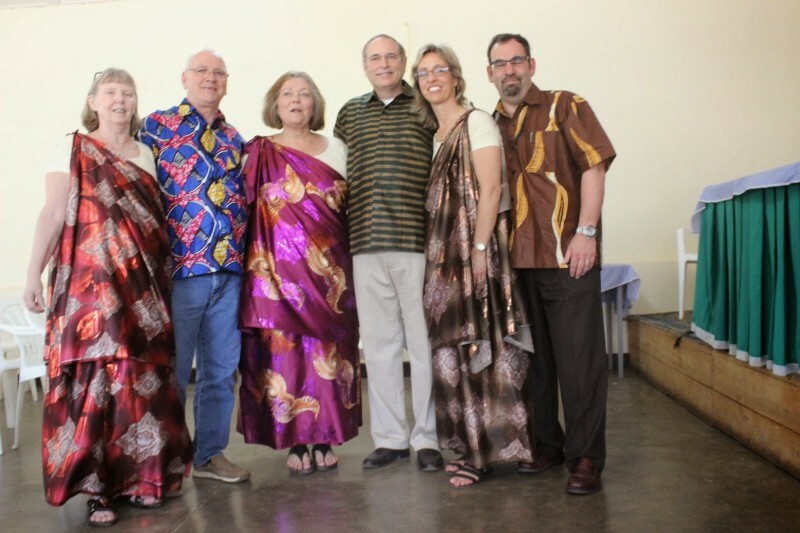 There has been tremendous support poured out to us by our Rwandan family. They have served us in every way necessary. The prayer circle gathered around Peggy prior to the surgery consisted of about 10 of us. Even now, at nearly 11, 3 pastors sit with us despite the language barrier. We are in good hands. They have eve drummed up a phone for John to use while he stays at the hospital during Peg’s recovery. And in the midst of it all, Peggy is insisting we continue with the projects. She doesn’t want to be the cause of things being left undone. Signs of a great heart to me. PS – It is now 12:45AM. We just arrived back at the house we are renting. Peggy is through surgery and doing well. The doctors say the surgery was successful. She had a plate installed as well as several screws. Pray for the pain to be manageable, especially as she travels home. God is good. Oh my gosh…..so sorry to hear that. Sending tons of prayers for Peggy and the team. Prayers for Peggy and the team. Praying for you all as you take in all you experience. Prayers for Peggy. Our dear Peggy (and John) … we were traumatized as we arrived to lifegroup last night to hear of your injury so we went straight to prayer and prayed for you and all for some time. Know that those prayers have not stopped nor were they absent when you fell. God has allowed to all of you a demonstration of the church in Rwanda – what a testamony! We continue to pray for God’s hand on each of you and for Peg, that you can manage the pain and all the connections by God’s grace and mercy and His provision. We pray for the rest of the team to carry on and fulfill God’s mission with renewed vision and hope for all God wants to accomplish. Blessings of His Peace to all. We are praying for no pain and a smooth trip home. We are waiting here at home to love you back to health. Praying for Peggy and you all. Will pray especially for that trip home, Peggy. We prayed for you last night in Life Group. So sorry about your accident. We love you. All of you, especially Peggy, are in our prayers. We pray that Peggy will have a safe, uneventful trip home. If she and John need to be picked up from the airport, I can be available. So sorry to hear this news. My prayers go out for all of you. Our thoughts and prayers go out to Peggy and everyone else there. Our prayers go out to Peggy and John as well as everyone else who is over there. Praying for a safe, comfortable journey home for the whole team. And especially for Peggy to have a easy, painfree journey and plenty of room to stretch out her leg. Would you like a hospital bed setup in the piano room at home, perhaps? We can contact Lizzy to arrange. Please let us know how we can help….. Hugs to all and will be praying!